This entry was posted in Air Conditioning on June 29, 2016 by . Ductless wall mounted air conditioners (also called mini-split systems or heat pumps) have been extremely popular in Japan and China for decades, mainly because they are highly efficient at cooling off small spaces without wasting energy. Recently, ductless wall mounted air conditioners have gained popularity in the United States, namely for their energy efficiency. 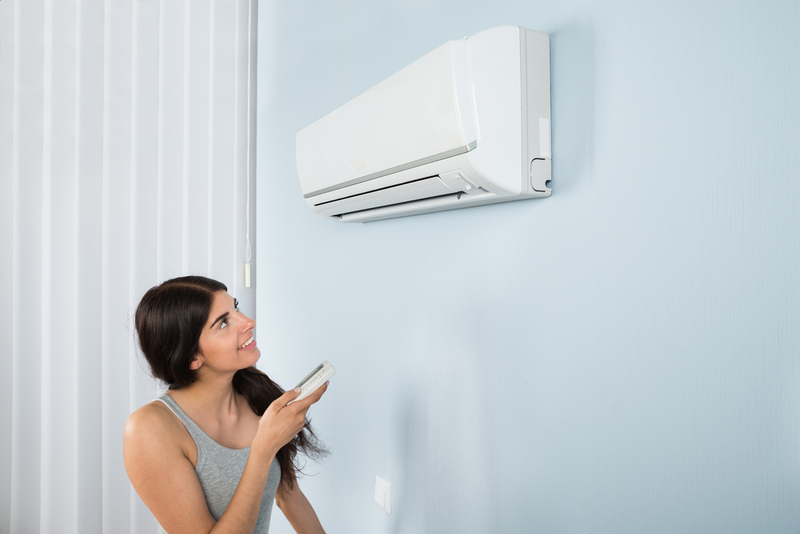 If you’re considering a new air conditioner, it’s important to understand the pros and cons of a ductless wall mounted air conditioner. Lower lifetime costs. Ductless wall mounted air conditioners allow you to cool just the rooms that you are using at the time, rather than worrying about the entire house. This allows you to cut down utility bills drastically. Versatile application. Because no ductwork is required, ductless AC systems are great for all sorts of buildings, including offices, apartments, condominiums, and single-family homes. Easy installation. While installation time depends on how many indoor units you need, the process is generally less invasive (and quicker) than installing a traditional air conditioner and corresponding ductwork. Improved air quality. Because you don’t have to worry about dirty ductwork, you can quickly experience better indoor air quality with your ductless wall mounted air conditioning system. Energy efficient. This is probably the most important feature of the ductless wall mounted AC system. Not only are you saving money, but you’re also helping the environment by consuming less energy and leaving a smaller carbon footprint. Initial cost. Ductless wall mounted air conditioners might cost you a bit more cash up front to install – especially if you need more than one unit for your home. Maintenance costs. Since ductless ACs are relatively new technology in the U.S., they require more specialized service. This could mean more expensive maintenance costs over the years, especially if your unit breaks down. Location is tricky. You’ll need a professional HVAC technician to advise you on the proper location for your ductless wall mounted air conditioner, since placing your ductless wall mounted AC unit in the wrong spot can render it virtually useless. Aesthetic appeal. Quite simply, some homeowners prefer the unobtrusive look of a traditional HVAC system, as opposed to the visible air handlers required by a ductless wall mounted AC system. Big home = more required units. Ductless wall mounted air conditioners are designed to cool off specific areas or zones. If you have a large house or building, you’ll need one unit for each zone. While this gives you more control, it also means more installation costs and more maintenance costs. In sum, whether or not you get a ductless wall mounted air conditioner depends on the size of your home, how much you are willing to spend on initial installation fees, and whether or not energy efficiency is important to you. We’ve heard many great things about ductless AC units, and it all depends on what exactly the customer is looking for and willing to spend. If you are ever in need of air conditioning repair and installation in San Diego give us a call today. Do you have a ductless wall mounted air conditioner in your home? Then we want to hear from you. Share your thoughts and opinions below.